So yesterday, I left us in Kyoto on New Year's Eve, visiting temples in the surrounding areas. What I didn't mention was the monkey population. You didn't think I'd leave out monkeys, did you? 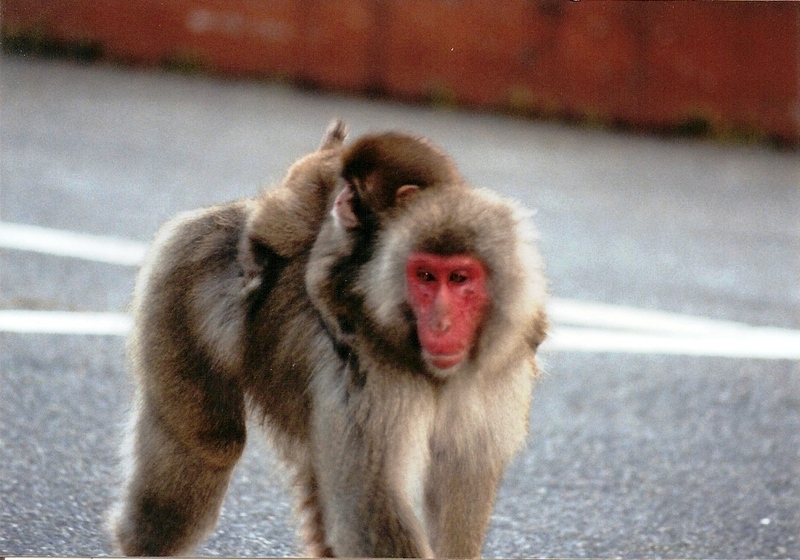 These two are Japanese macaques, also known as the Nihonzaru (Japanese monkey) or the snow monkey. 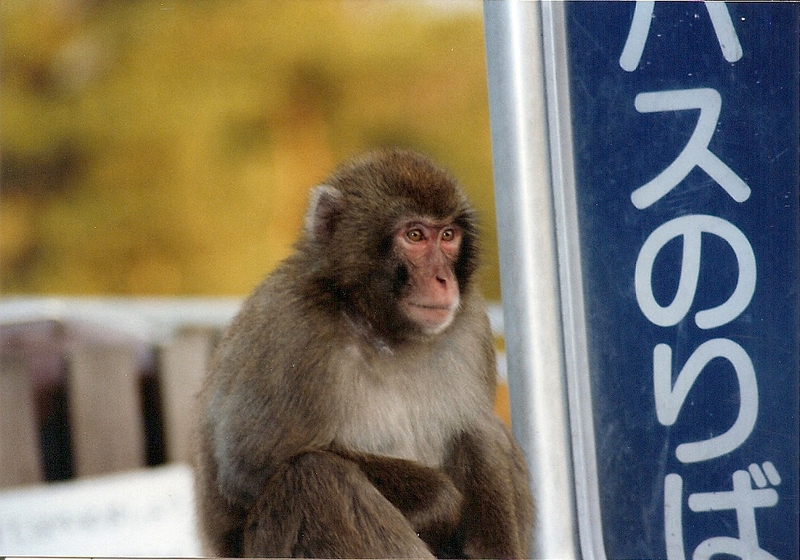 They are the world's most northern living primate (with the exception of humans) and you may have seen pics of them enjoying a nice hot onsen in the snows of northern Honshu. They also have incredible swimming abilities. 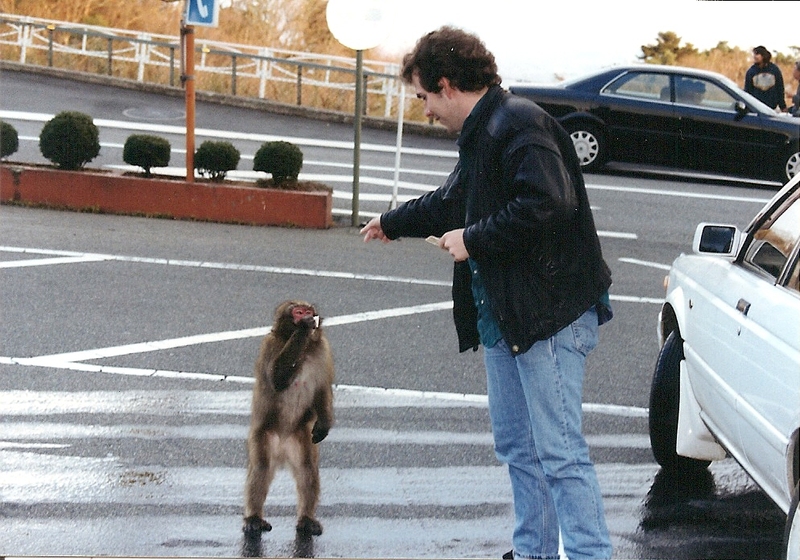 Now, living in rural Japan for three years had taught us that occasionally the Japanese displayed odd behavior when it came to animals. When reports of a bear surfaced in the mountains near my school, children were given tambourines to carry with them as they walked home, the rationale being that the noise would scare the bear away. The neighboring town experienced complete mayhem one day when a wild boar came into town, raced along Main Street, through the small department store, and off again. Time for those tambourines and whistles again! My school went into lockdown one day because of a small snake outside the main door. Finally, the vice-principal snorted and braved the harmless grass snake, tossing him down a drain. 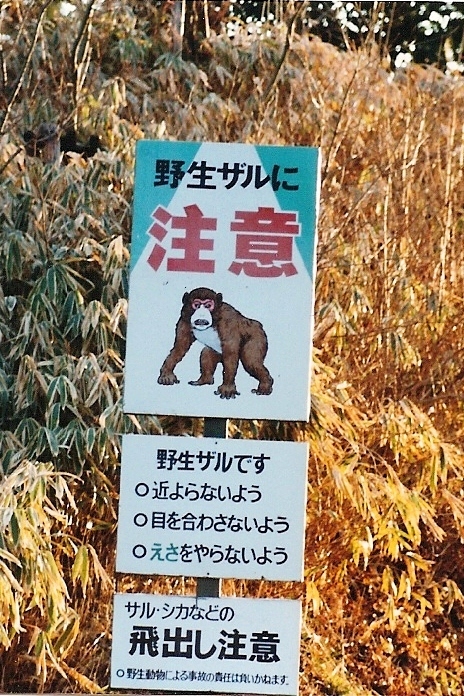 So when we saw a sign warning of dangerous monkeys, Nic and I honestly did not take it too seriously. NB: For those of you wondering about my suitability to be near primates in South Africa, please know that this happened 15 years ago and I have learned much since then. The sign certainly seemed all the more implausible as we drove further up the road and passed several macaques waiting patiently in line...at the bus stop. Kind of looks like all he's killing is time, waiting on that bus. A few hundred yards or so further along the road, we came to a parking lot for a scenic look out, and a host of monkeys. 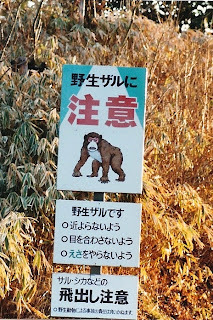 Given the empty bags of corn chips and candy laying around, it seemed obvious that ignoring the directive not to feed the monkeys was being routinely ignored. Please, people, do NOT feed them. 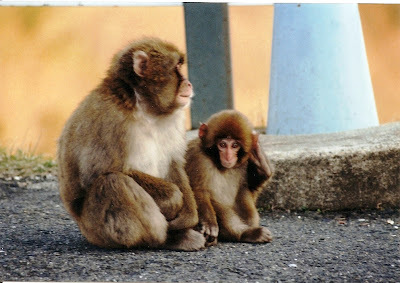 It is irresponsible, bad for their health, and potentially dangerous for you and the monkey. Being mindful of the signs, I did, however, want to take some pictures. So we got out of the car and I started snapping away, being sure to keep a safe distance. Unfortunately, we had not counted on the ingenuity of these little guys, or on the attractive smell of a tin of Band-Aids in our car. Despite it being New Year's Eve, the weather was cool and sunny, so we had left the windows wound down...which meant we turned back to the car to find one sneaky macaque exiting the back window, clutching the tin in the happy bliss of successful thievery. At this point, I panicked. If they opened them and tried to eat them they could choke and die. 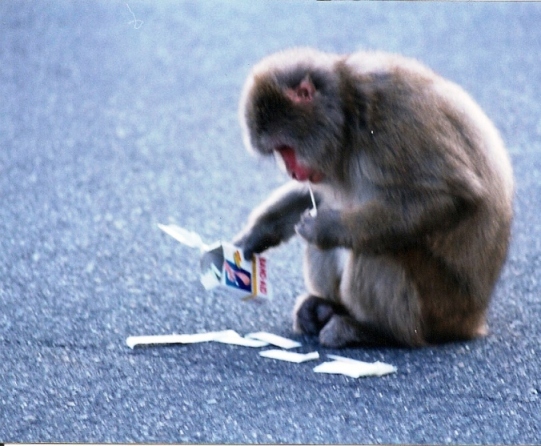 The last thing I wanted on my conscience was having caused mass monkey death by Band-Aid! Enter Nic. My brave beau Nic. Out of concern for me or the monkeys, I'm not sure which, he understood the need to retrieve the tin. 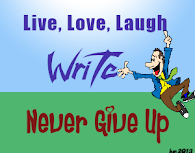 So he calmly approached the happy bandit and raised his arms. The plan worked. Monkey dropped tin. Monkey left. Nic picked up tin. Except monkey wasn't quite ready to give up, just yet. He came back...with two buddies. Now in the picture above, Mr. Macaque doesn't look too big does he? His friends were bigger. And once they all reared up, arms above their heads, they looked significantly more like their friend on the warning sign. One Nic. Three unhappy monkeys. Nic chose the sensible plan. He dropped the tin, ran back to the car and we continued on our way to the temple. 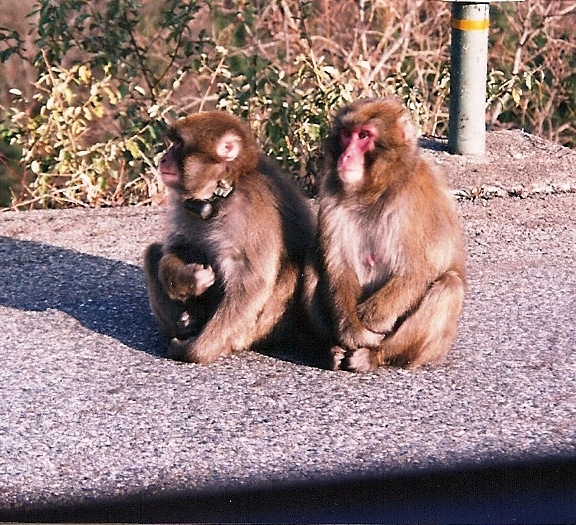 When we drove back the same way later, we noticed that fortunately the monkeys had not eaten the Band-Aids. Instead, wrappers lay scattered everywhere while the three males strutted around with little stripey plasters attached to their fur. It added an extra dimension of fearsomeness. Meanwhile, the women and kids were still waiting for that bus. Wondering how the day could get any crazier? We haven't seen in the New Year yet. Come back tomorrow for the third and final installment, complete with cowboys, fireworks, and a rendition of Dolly Parton that will never be forgotten.